In 2013, AIT’s Bridge-in-a-Backpack System incorporated Strongwell’s COMPOSOLITE® building panels within their design. 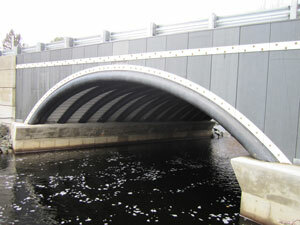 AIT’s system can be designed for bridges which are of single or multiple spans. The Jenkins Bridge located in Maine was designed by Kleinfleder Sea Augusta and installed by Wyman and Simpson, Inc. This bridge spans over 28’, has a width of 34’ and a 6’ rise. This bridge was rapidly installed with the COMPOSOLITE® Building System to create a corrosion resistant soil retention headwall system. Within its first year the product encountered an ice floe which dammed up the bridge opening, leading to extreme hydraulic forces, with no effect on the bridge. Utilizing this quick-install system with materials which provide excellent high strength to low weight ratios translated into lower installed costs through the reduction of personnel, equipment, traffic congestion, and construction schedules. The AIT Composite Arch Bridge system is an excellent example of how composites can be used to replace steel in vehicular superstructures in corrosive fresh and saltwater environments without compromising aesthetic appeal or increasing maintenance requirements.